Today was one of the best looking days in San Luis Obispo Co. for XC in a long time. Patrick pinged me early and we decided it would be an early day so we met at 10AM at launch. Cumulus clouds were popping in all quadrants and the cycles were causing regular gusts up the face. We hurriedly set up our gear and were ready to launch by 10:30. My goal was to take advantage of the Westerly flow and make a downwind dash to Mike's place (about 20 miles East) and then reassess and continue to reach I-5, if possible. 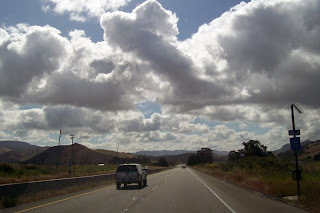 I had not made the crossing to the range East of Santa Margarita, so this would be fun and new. I launched first and scratched a bit, before contacting a ripper that took me right to cloudbase at 5000'. Patrick was working up also so I headed over the back to the East side of 101, where I expected to catch another thermal under the building clouds. All I found was trashy sink and soon found myself landing at the small airport near town. Patrick came over & also dirted after only a few miles. Jack was kind enough to drive over and pick us up so we could give it another go. The wind had come up quite a bit in the interim, so neither Patrick nor I were planning to go XC the second time, but when Jack called to say he'd decided not to launch in the freshening wind, and would drive retrieve, I was ready to head over. 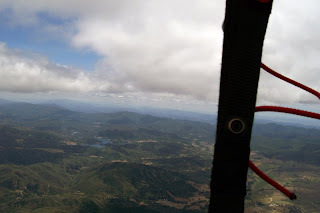 This time the cloudbase at launch was over 5300' and when I got the second climb in trashy air in the lee of the East ridge, it was 6-700'/min. to 5800' cloud base. Unfortunately, as I headed East at over 40 mph groundspeed (that's bookin' for my PG) it became apparent that the ground was shaded and the wind, that was adding to our groundspeed, was also breaking up the lift. The landing options are so much better than I had expected while driving through the area and the route is not as intimidating as I had previously thought. I expect to go this way with more success in the future. It was a fun flight for a short 13 miler, but it really got Patrick and I thinking about the possibilities of the route. I snagged a ride, with a nice local guy named Scott, for the 5 miles to Hwy 58 and we picked Patrick up on the way. Jack soon picked us up on the Hwy. Thanks for the time behind the wheel Jack - we really appreciated it. Dave S. and I headed to Dunlap on Wed. afternoon with the intent to fly 3 days and then participate in the SFBAPA league events over the weekend. When we arrived at launch the conditions looked perfect for a nice 'shake-out" flight around the valley. We camped at Dan's LZ and enjoyed a nice dinner up the road at the pub. 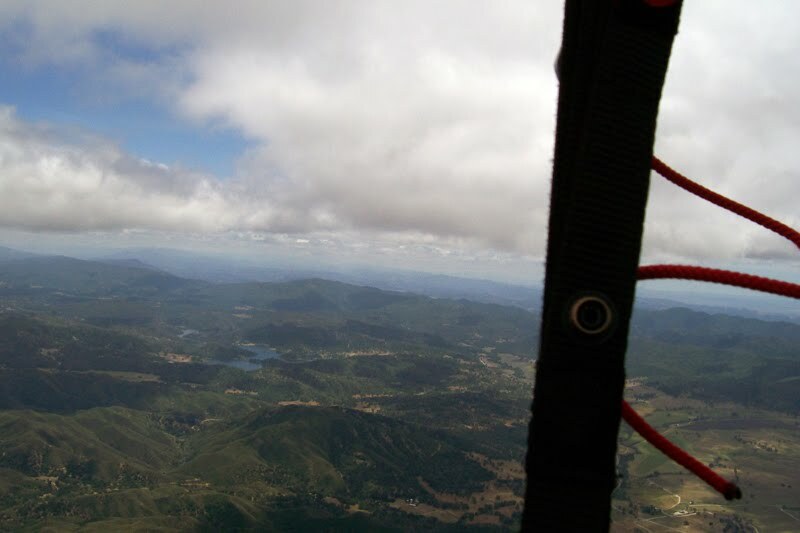 Thursday Jug Arrived and we had another fun flight around the valley under great cumulus clouds. The top-of-climb was low but it was still possible to move around the valley. Friday was more of the same and I made the decision that I would be flying my Avax XC2 in the weekend comp. 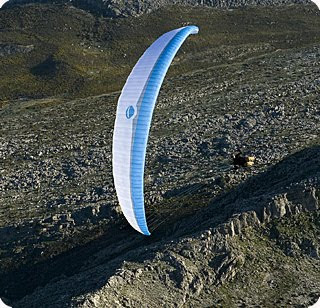 I've decided to fly Serial class in the coming season and have ordered a new Gradient Avax XC3. The Boomerang 5 is a great wing and I've enjoyed flying it for about 30 hours. It never did anything squirrelly to me and has great glide performance. I just didn't connect with the wing. I didn't trust it and felt that I could actually score better on my XC2 or new XC3. Maybe I'm not ready for a comp wing yet - I'm OK with that. I'm firmly of the opinion that we all fly better on wings we are confident in and flying well. 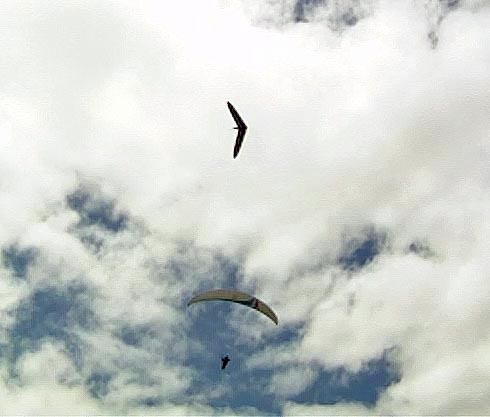 I do know that I can't compete, in the open class, with the latest 2-line wings on a two-year-old Boom 5 so I might as well fly the wings I enjoy flying and that are at the top-end of their class. Saturday the troops all assembled at Dan's at 9:30 and we headed up the hill at 10:30. The conditions were forecast to be good with lift to 6-7000' and a NW wind in the valley. 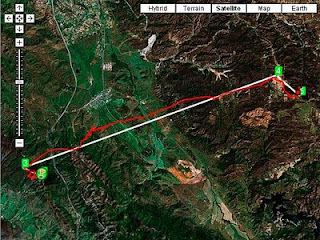 A task was called from launch to hill 49917 and back, then over Big Cat - and Bald, then a leg to Orosi in the flats for a total of 25 miles. I had a good high start and barred it all the way to Hill 49917 the lift there was sporadic, but I soon found a thermal pulsing off the hill. I climbed high enough to get back to launch and caught some lift with the lead gaggle. We all headed down to Big Cat and then hit the 4km cylinder around Bald Mtn. A few wings turned directly to Ruth Hill and were struggling low in the shade, so I was looking for alternatives. To my right (the wrong way to Orosi) was in sunlight and I thought about heading there to poach a bubble off the low hills. At that same moment, I noticed Josh coming across low to the same area. He began to circle low in weak lift and I came in on top of him. The lift was weak but soon bloomed and we climbed together to over 6000' which made it possible to pick our way past the shade at Ruth Hill and start a relatively straight forward flight to Orosi. The clouds were working well and lift was often 500-600'/min. Josh pulled ahead when it was obvious that the flight was going to be easy and beat me to goal by 3 minutes. Fredric and Steve made it to goal about 30 minutes later and Hoop made a great effort, landing 1km from goal. Lesson reaffirmed: Don't follow others into conditions that are obviously NOT working. Look for viable options and try to capitalize on the opportunities they present. Sunday's task was started in conditions that included low cloudbase and some forecasts of convective activity. We built a 19 mile task that would put more pilots in goal and keep them in the Dunlap Valley. After looking over the conditions I decided to launch early to sample the lift and make sure that the convection was reasonable. Climbs were plentiful and the lift didn't increase in intensity as the cloudbase was approached. As the start time approached conditions felt better and as we made a glide into Hill 49917 the trend was obviously better. At that point I just concentrated on the race since I was in the hunt with Josh, Eric, and Fredric. By the third turnpoint I was in 4th place and the flying was fast. Josh had stopped to take a climb after Big Cat, on the way to Airstrip, while Eric and Fredric continued into Granny's Knob low. It looked like they had gotten stuck on the knob, so I took the next 400'/min climb and topped out at around 5500'. This gave me sufficient height to overfly the guys while they wrestled with sporadic lift, low over the knob. I was fortunate to pick a great line that actually provided lift as I tagged and returned from the Airstrip. All I needed for the last 7 miles of the task was one more climb, which I took just short of Big Cat. I knew Josh was on final glide and Eric was hustling to catch me, but I took the climb at least 1000' too high and had way too much altitude for the final glide. A rookie mistake, but I still placed second for the day - 4 minutes behind Josh. I feel very good about the weekend for two reasons. Firstly; My indecision regarding how I was going to compete this season (and in future seasons) was resolved, as I sold my Boom 5 on Friday and ordered a new Gradient Avax XC3 on Thursday. I'm flying serial class for the foreseeable future. Second; I left the Boom in the bag and flew my three-yr-old Avax XC2 well this weekend and placed 2nd to Josh in both tasks. I really feel like some of the effort I've put into studying the game is paying off. The league has really flourished due to Jug's efforts. Introducing the Mentoring program and reevaluating the goals of the league to promote the participation and education of newer pilots has revitalized the league. It's going to be a great season. Every one of us has done it. Had something happen that makes us look around and think. "WOW, that could have been really bad!" For many it happened in a car. For most who read this blog - it happened while hanging in a harness and realizing exacly how fast 32'/sec.2 really is. 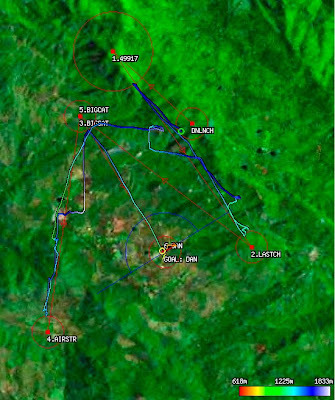 It might have been a shoddy approach to a sketchy, too small field; or it might have been a collapse right after a mis-timed launch that threatened to swing us viciously into the hill - These are moments we will permanently burn into our flying brain - so that the fact we dodged the bullet - this time - isn't lost on us. That we are able to fly another day makes us more appreciative of that fact, and more careful to protect that ability. We've all gotten away with some scary moments. Every once in a while we don't. 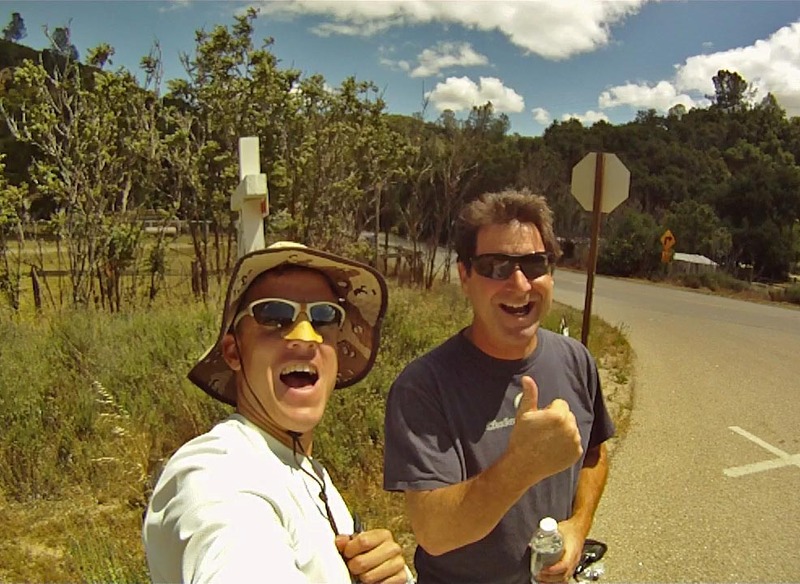 At my first paragliding XC competition, The Rat Race, I met a great guy named Jeff Huey. He was a top-10 pilot who was a bit older than many of his contemporaries and a respected pilot. He's generous with his advice and as humble as they come. He made an impression on me because I had definitely been bitten by the bug and he had attained a level of competence and respect that I aspired to - Shortly after the comp, it happened. I heard about his accident through the grapevine. He had crashed in Mexico while practicing before a comp. He had broken his back and had profound loss of mobility. That was 4 years ago. As many are aware, Jeff Huey is paralyzed below his chest as the result of a paragliding accident he suffered in Mexico four years ago. The injury was a broken neck at C7 which required the removal of the broken vertebrae and hardware installed across that area. Jeff’s recovery after his accident has been inspiring! Until recently he has been driving himself to his rehab sessions at the pool, working around the yard and performing all the other tasks we all face daily. Unfortunately there has been a series of medical complications and setbacks which required Jeff to endure an extended hospital stay with a specialist in Seattle, WA, far from his home in Bend, OR. The recent problems began with high muscle tone on the left side of Jeff’s body tightening and pulling the ball of his femur out of the socket, which would then go back in place when his body would relax. The socket eventually wore out, creating significant pain where the ball of his femur was wearing through the socket. Jeff can’t necessarily feel pain below his chest at the site of an injury, but his body does and the effects of the pain make his daily routines extremely difficult, or even impossible. In May 2009, Jeff was injected with a shot to deaden some of his leg muscles to prevent them from pulling the ball from the socket. Unfortunately this didn’t solve the problem, and so in October he underwent surgery to have the ball of his femur removed: the first half of a hip replacement which can be completed if he regains movement in his legs. But after this surgery severe pain was still present. Images taken of his spine revealed that two more of his vertebrae, T9 and T10, had disintegrated and a third was wearing away. This is right at the point in his middle back where he can move his torso, which created a kind of unsupported hinge which ground away the bones. In January Jeff found a surgeon in Seattle to fuse the vertebrae from T5 to L1. The surgery went well and after a short stay in the hospital he returned to his house in Bend and was doing well with his recovery. After a short time, however, the recovery took a bad turn and Jeff was again feeling the effects of severe pain. He endured this deteriorating condition for several days before being urged to have things checked out at the local hospital. The following day a new CT scan showed that several of the screws had been pulled from the vertebrae they were anchored to, causing significant damage to those vertebrae. It is likely that the screws pulled out during a transfer from his wheelchair to another surface where he slipped to the floor, but the cause remains unsure. The next day Jeff was flown Air Life to Seattle to his surgeon and she fused C6 to L1 to span the new injury. Two days into the recovery, while heavily sedated, Jeff fell out of the hospital bed. Apparently the side bar was left down. When found he was in respiratory distress because of fluid on the lungs, requiring yet another trip to the ICU, where tubes were put in to drain the fluid. The fluid turned out to be spinal fluid, so Jeff was fitted with tubing into his spinal column to relieve the pressure. The procedure was successful and Jeff was transported back to Bend to a skilled nursing facility where his recovery may take up to twelve weeks. Through it all Jeff remains in good spirit and continues to amaze with his expanding medical knowledge and humor in the face of it all. Jeff has excellent medical coverage, but even so it doesn’t cover all the expenses associated with something like this. While his hospital services were covered his coverage for care at the nursing facility has run out and he will be required to pay $6,000 for the final four weeks of care. He will also have to pay $5,000 out of pocket for his ambulance transport from Seattle back to Bend. In light of his situation we have set up a pay pal account where anyone who feels like helping out can do so. Pay Pal users can send donations to "jeffh22037 (at) yahoo.com"
Also Jeff is registered on Facebook if you would like to send him some encouragement!